"We check your home when you’re not." Please make your Pet & House Sitting reservations in advance for all major holidays: Christmas, New Year, Spring Break, Easter, Memorial Day, Independence Day, Labor Day, Thanksgiving and all Three-Day Weekends. Special Note: Thanks to all of my existing clients! Due to your continued support, as of January 2008 I will be limiting the number of new clients and preference will be given to referrals. Please note: Everyone’s home is a little bit different. The above prices should be considered ‘guidelines’ that we will try to follow as much as possible in preparing your estimate and quote. From time to time we evaluate these prices and make adjustments to allow for increases/decreases in materials & labor costs. You can be assured that before you leave, your contract will show what prices will be in effect for your trip. If you need something done or taken care of that is not shown, please ask and we will try to accommodate your requests and needs. Our #1 goal is to make sure that your home runs as smoothly as possible in your absence. When did you start Karl’s House Check? 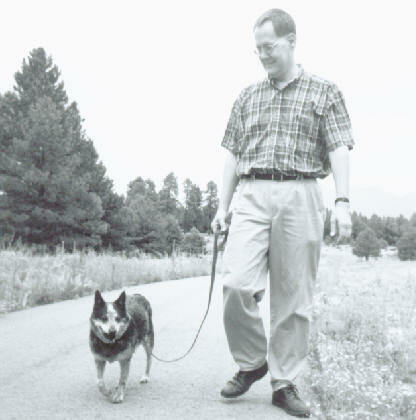 I have lived in Flagstaff since 1975 and I have been operating Karl’s House Check as a professional house & pet sitting service since October 1996. Why did you start Karl’s House Check? I experienced a severe water leak at my home (apartment) while away on vacation. That made me start thinking about how to prevent something like that from happening again and it developed into my idea for a "House Checking" business. Some very wise advice from my family caused me to include "Pet Sitting" as well – a natural combination for me since I have always seemed to have a special bond with our family pets and just about all pets I meet. What do you do when making your "House Checks"? How much will it cost to watch my house and pets? One dog, inside home at night, inside fenced backyard during day, no doggy door, home located inside city limits, I have been issued a set of keys since they are "regular" clients. Two visits per day: $20 for (1st) morning visit and $15 for (2nd) evening visit. No key pick-up or drop-off fees. No mileage charge. Two cats always inside, home outside city limits, I have not been issued a set of keys even though they are "regular" clients and this is their tenth contract. One visit per day: $20 for visit (usually evening). Key pick-up & drop-off fees total $30. Mileage charge of $0.50 for each mile past official city limit for all trips made – including key pick-up and drop-off mileage. Summer home within city limits, Clients stay in Flagstaff May through September, would like House Checks twice per month during October through April while away. Each House Check visit during “winter” months: $20. Quarterly invoices are sent for services at the end of each quarter – March, June, September and December. How long do you stay at a house? When looking after pets (usually dogs & cats), I generally stay about 30 minutes for feeding, cleaning up, playing and whatever else is part of their routine. Do you ever stay overnight? No I do not. However, I am usually able to arrange an appropriate number of daily visits to take care of almost all situations and satisfy both the pet(s) and pet owner(s). Do you ever care for pets in your own home? No I do not. This would require specific facilities, licenses, insurance and much more that would basically turn my business into a kennel. What about leaving my pets at a kennel instead? Many pets do quite well at kennels. Most kennels have quick access to veterinary care that can also be very important in certain situations. My clients and I agree that the pets I look after seem to be much happier and calmer staying "at home". Even though it is usually quieter when you are away, I find that most pets settle into a comfortable routine within a day or two after you depart. For my "regular" clients the adjustment time is usually much shorter or even non-existent as soon as they see that "Uncle Karl" is back again. Do you have any references or clients I can talk to? Many of my clients are available as references so please feel free to contact me if you would like to speak directly to some of them or if you have any other questions about your particular needs. If I am staying in a Flagstaff area motel, can you watch our pet? Due to the complexity of arrangements and other insurance considerations, I do not perform pet-sitting when the clients are staying at hotels/motels in the area. If you are staying at a rental property that is a "home" while in Flagstaff, this would probably be a situation where my services would be appropriate. What happens to my pets if I don’t return on time or return early? Because there is always a chance that travel plans can change, you simply contact me if you return early so I stop visits before planned. If your plans change and you stay away longer than expected, contact me and I usually can accommodate extending the time I make my visits. If for some reason you are unexpectedly delayed, I will continue making visits until you return and I hear from you to make sure your pets are not left unattended. Do you charge less for houses without pets or for checking only on the outside of a home? Although I did start out with those types of different fee levels, I now have one standard price level that is the same for [pets] [no pets] [whole-house] [inside only] or [outside only] House Checks. When I first designed my pricing levels, I thought these different details would make a difference in how much should be charged for each visit. Now, after many years of running my business, I have determined the major expense comes from making the trip to the home (travel cost) and taking care of whatever is needed (time cost) – the minor details have very little to do with my final expenses. Therefore I now use a one-price structure that is also easier to understand. Ask me directly with an email and it may even end up here in my FAQ list.